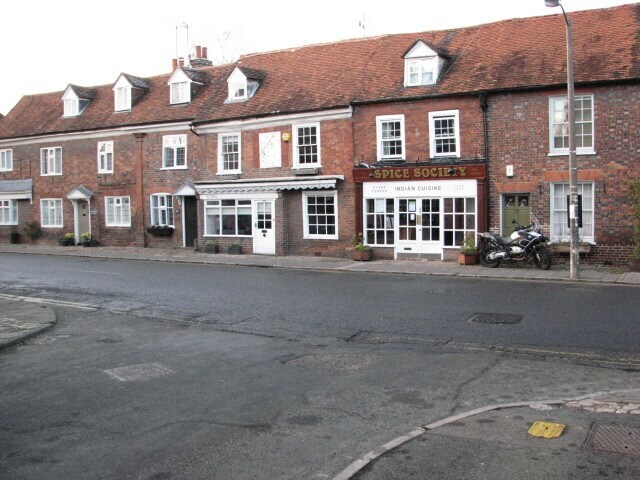 No 19 was an antique shop until recently and before that it was Mr D Welch’s butcher shop (see photo below) and was later run by Mr Mayo, who then moved to Chesham Bois. The house is not as old as the sundial suggests – probably late 16th century, but one story is that the 1372 sundial was dug up in the garden by a Mr Wright before it became a butcher’s shop. The other story is that the builder restoring the house made a mistake – he meant to put 1732, but when asked to change it said ’Leave it as it is, it looks better’. Before Mr Welch opened his butcher’s shop, Mary Scott and Edward Scott lived at no. 19 and appear in the censuses between 1861 and 1891. The Scotts were also butchers and their shop was opposite at no. 36 which was open by 1895. It is possible that the Scotts’s shop before then was at no. 19.